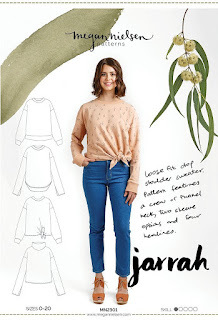 The Jarrah Sweater is a great pattern with no less than 4 different options (I want to make them all)! 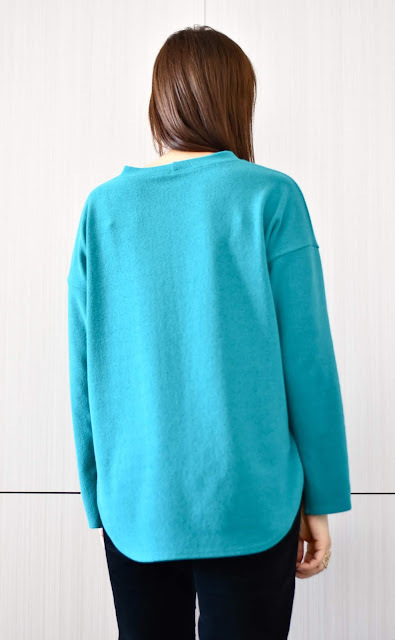 This is view B - a slightly oversized sweater with a round neckline, hi-lo curved hem and split sleeves. I chose size 4 according to my measurements and the fit was spot on. My only modification was to shorten the sleeves by 3'', they were so long that they were going down to my fingertips - not very practical! 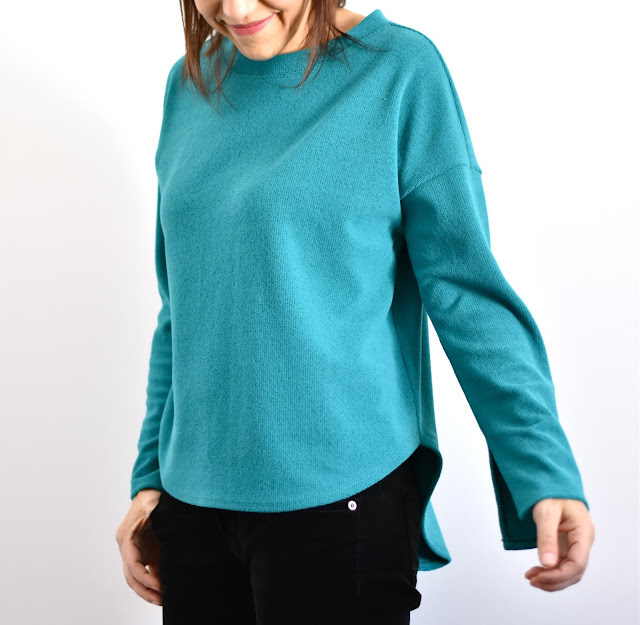 This beautiful technical sweater knit is very interesting; it has two different faces, one is smooth, the other more plush and slightly lighter in colour - this is the one I chose as the 'right' side (although there is no right or wrong side per se). It is a bit thicker than most of the lightweight jerseys presented on the Malden Mills page, but it is not heavy at all and it has a dry hand just perfect for a sweater or a zippered hoodie. This polartec fabric sewed very well and was super fun to work with. It presses well and I was even able to coverstitch the small 1 cm seam allowances on the split sleeves openings without any problems. 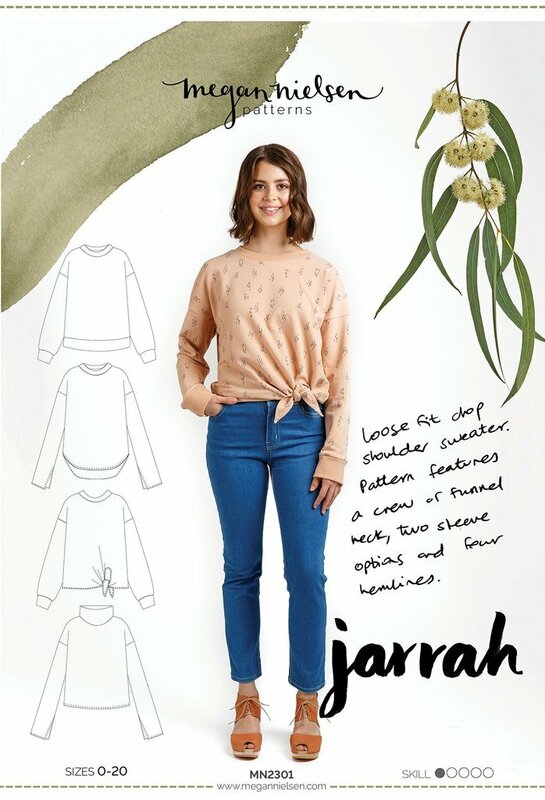 The Jarrah sweater has a great hi lo curved hem that adds a lot of style and interest! When I make garments with pronounced curved hems like this one, I usually hem the front and back separately, then join them at the side seams - it creates a beautiful clean, even hem and there's no need to pull or stretch the fabric. I don't know what else to add than I really love this sweater in this particular fabric and I might even buy some more for another project (if there is still some left!). I hope FM can get this fabric in other colourways too, and I highly recommend it for any sweater/hoodie/vest project. The Jarrah Sweater is so comfy, and that colour makes me happy! 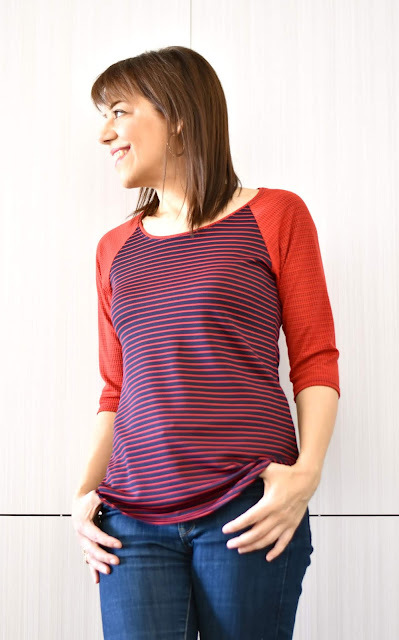 As I was searching for a raglan top pattern for my second project, I stumbled on a pattern I had never made before: Jalie 3245. It was still sealed in its plastic envelope and I told myself that it was really time I make this pattern! It is still as good and current as it was when it came out a couple of years ago and thanks to FM for pushing me to sew patterns I've never made before! I made my usual size R with Jalie, the only modification I made was to raise the front neckline by 1'' for more winter coverage. The fabric I chose for my second top is equally fun to work with. I had originally planned an all red raglan top, but when I received the fabric I thought that the striped side was super cute and I decided to use that side for the bodice and use the red for contrasting sleeves. 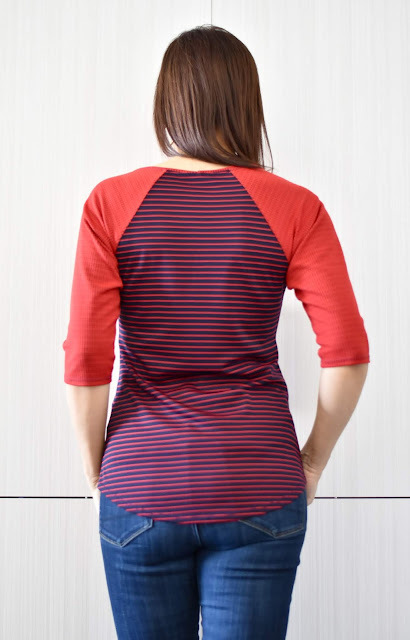 This one is a lightweight technical jersey that also sews and presses really well. It comes in many colourways, and if you are interested in the red there is still plenty of it here. (And it is today's Sue's Pick! 2/13/19). I recommend this fabric for any t-shirt, top, and why not also for a maxi skirt or a wrap dress? Quite pleased with how the stripes match on the sides! Thank you Fabric Mart for giving me the opportunity to try new fabrics! I'm keeping an eye on the Malden Mills page on the website as I will surely need more of those technical knits for future projects. Don't hesitate to try them, they are easy to work with and easy to incorporate in a casual everyday wardrobe! See you for next post in March, and in the meantime I wish you some quality time with your sewing machine!